West Caldwell, N.J. – The fourth quarter in any football game is the most critical period, the one where decision making can win or lose the game. It’s the same for many printers such as Karr Graphics in New York City. Faced with a tough decision heading into their busiest time of the year, Larry Karr made a great call. He bought a new 36-inch PRISM® paper cutter with Microcut® from Colter & Peterson that has produced winning results since October. That kind of endorsement reflects an enormous amount of respect considering the reputation and client roster Karr Graphics has cultivated in the Big Apple and on Long Island since 1965. The Benny Award winning traditional offset and digital specialty printer does high-end work for the crème de la crème of luxury brands and not-for-profits. Karr Graphics utilizies Heidelberg offset presses, a trio of engraving presses and four embossing, foil stamping and die cutting machines, But the purchase of an HP Indigo 6-color press for digital work was key to their future business strategy. “More of our clients had started asking for short run digital work. Once we installed the Indigo, we stopped brokering out the digital print business and kept it all under our roof,” informed Karr, whose 41st Avenue shop has a spacious 20,000 square-feet. “The Indigo produces such great quality, most people can’t tell the difference between offset and digital printing. Since then, we’ve been upgrading our equipment and we decided to address our finishing department with more automation. 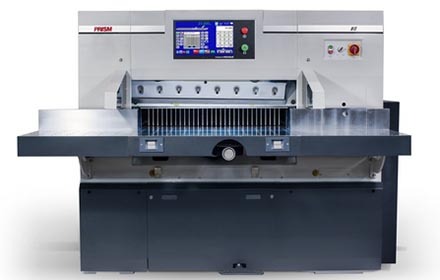 Karr says the new PRISM paper cutter is making a significant difference, with the Microcut electronics package responsible for helping boost productivity. “The reliability of the machine is huge and my operator loves it. We’re not using all the new bells and whistles on it yet, but we will once he gets more comfortable with it. He’s used the automation to set a number of programs that we use on a regular basis. Our offset jobs vary so it is saving a tremendous amount of time in set-up by recalling all of the cutting information for a specific job.